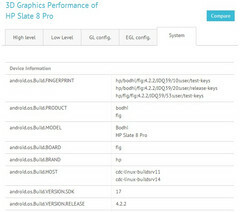 The unconfirmed HP Slate 8 Pro almost managed to beat the Snapdragon 800 powered Sony Xperia Z in a series of benchmarks. After the HP Slate 7 failed to capture much interest, Hewlett-Packard decided to refresh its family of tablets and started working on the HP Slate 8 Pro. 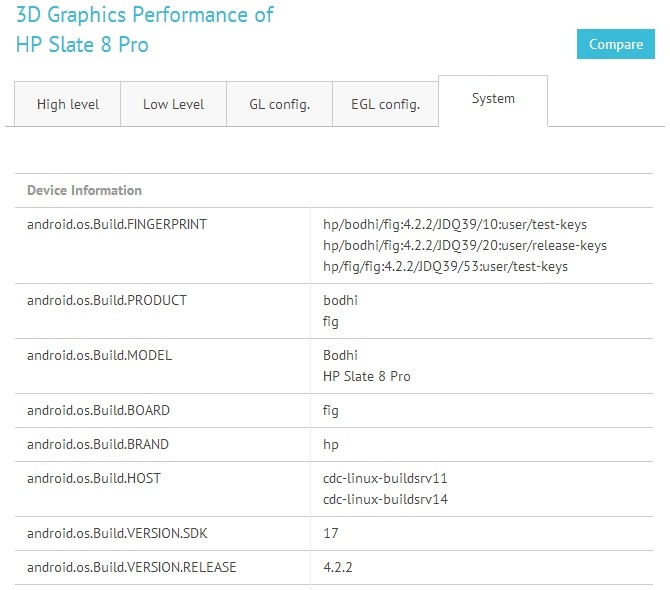 Nothing is official yet, but benchmark results spotted recently on GFXBench are showing that the HP Slate 8 Pro may soon become a very interesting choice in the mid-range category. Codenamed Bodhi, the upcoming HP Slate 8 Pro has managed to come really close to the Sony Xperia Z Ultra in the Egypt 2.5 HD test, scoring a total of 5,489 frames - an average of 48.6 fps. Currently, the GFXBench page dedicated to this device still has some gaps to be filled and surprises may arise in the days to come. Overall, the performance of the 1.8 GHz NVIDIA Tegra 4 processor should allow the Slate 8 Pro to compete with Google's Nexus 7 and Samsung's Galaxy Tab. For now, the pricing and the full list of features are still unknown. According to the rumors, the HP Slate 8 Pro is loaded with Android 4.2.2 Jelly Bean and features a microSD memory card slot, an 8-inch touchscreen display having 1600X1200 pixels, as well as a battery with a capacity exceeding 5,000 mAh. We will get back to it as soon as new information emerges.